IGT content management services helped a leading hotel technology company manage data gathering, loading, verifiying and publish on various tools and applications like GDSs, Salesforce etc. Time taken to create new property data reduced by around 83%. The client is a leading cloud-based solutions provider for hotels around the globe. 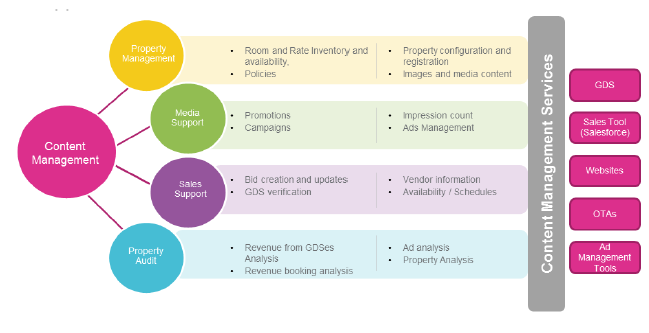 The client offers hotels world-class reservation solutions, business intelligence products and comprehensive media and marketing solutions to help hotels grow their businesses. Risk Mitigation approach: IGT created a framework based risk mitigation approach offering 99% accurate data loading. IGT has redefined data loading process by identifying critical points of failure and appropriate quality control techniques are used to reduce any errors.